Go Realty Unplugged: Where Do We Go90x from Here? Where Do We Go90x from Here? As we finish Go90x and head to next week's Go Show to celebrate the accomplishments, a few things jump out at me. Go Agents are an incredibly creative bunch. Observing you do your work, find ways to fit the activities in your schedule, and keep your workbook notes - every agent is different while doing the same activities. So many of you had and shared "Aha!" insights. It's electric when the real teaching and learning is going on between us instead of to you. I love the team work and cheer leading. I can't count the times when someone shared with me how another agent had helped, encouraged or challenged them. Working in partnership groups for accountability and support is one of the most important things we can do to grow our skill sets. It also makes work a lot more fun. Video communication is emotional: laughter, insight, warmth, and compassion are qualities you all did an outstanding job of communicating through your films. It lays the ground work for relationship and deepens what we know about others. Most of all, when I watch those videos, I believe the public has got to say, "That's someone I want to meet." Deadlines are powerful: knowing that something HAS to be done by a certain date creates energy and creativity. Although we almost wore Paula out in the final week, you did amazing things to get your agent contacts in front of her. Check-ins for daily activities were also significant for meeting quotas on contact activities. I encourage you to continue to use deadlines on a weekly basis to reach your goals. This stuff works: everyone had a breakthrough this month. A strong majority of the group has new business. You all have sharpened your skills and deepened your professional confidence. It's not about the iPad. Or Vegas. Yep, those are exciting prizes, but that's not why we do Go90x. It is about changing our behavior. The real possibility is, "What if worked liked this all the time?" I have no doubt that ongoing commitment to these activities positions us to achieve all we want in our careers. So where to do we Go90x from here? We may have finished the workbook, but the real Go90x starts tomorrow. That's when you decide if it continues. 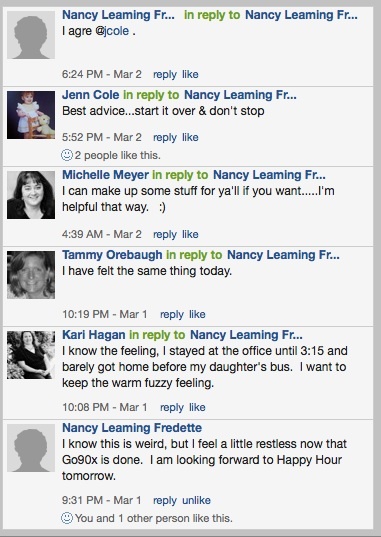 I love Jenn's conclusion on this Yammer dialogue, "Best advice ... start it over and don't stop."